❂ BodyTalk is a Natural HealthCare System based on the premise that the body has the ability to heal itself provided that internal lines of communication are functioning properly. ❂ Children benefit from BodyTalk by helping them positively navigate friendships, school, ability to focus, and peer pressure. ❂ Newborns benefit from BodyTalk sessions. BodyTalk is fabulous for babies who are having issues adjusting to life including breastfeeding issues, colic, and traumatic births. ❂ Toddlers who are experiencing developmental delays or sensory issues of any kind including bonding, and emotional issues can benefit greatly from BodyTalk. ❂ A parent acts as a surrogate for the protocol navigation and techniques are most often done on the child if the child is present during the session. ❂ Adults love BodyTalk because it addresses what Conventional HealthCare does not and offers answers into the missing pieces of their health puzzle! BodyTalk is whole healthcare. It’s about understanding the psychology of the body and the influence it has on your health. In BodyTalk, the whole person is taken into consideration. The physical health, as well as emotional, spiritual and environmental influences. It’s about recognizing and releasing the true cause of dis-ease. The client’s ability to heal themselves is then kick-started into action. While BodyTalk does not diagnose or treat specific ailments, clinical experience has shown that once the overall internal systems are balanced through BodyTalk, clients have exhibited significant improvement in the areas of Depression, Phobias, Arthritis, Chronic Illness, Insomnia, Pain, Infections, Stress, Digestive Disorders, Sports Performance, Allergies, Learning Disorders, and Addictions. There no side effects from doing BodyTalk. Because each session is guided by the client’s innate wisdom, it can never do harm. The client’s innate wisdom will always know what the client needs. The goal will always be to heal. This makes BodyTalk an extremely safe modality. The most common “After Effect” of a BodyTalk session is a really good bowel movement. When we do BodyTalk we stimulate the release of a lot of stress. Much of this stress gets processed through the digestive system 24 to 72 hours after a treatment. A practitioner begins by discussing the client`s health status and any personal issues needing care. The client is usually relaxed on a massage table while the practitioner gently touches the client’s arm to establish Yes/No communication with the BodyMind Complex and Innate Intelligence. From there, the practitioner navigates a BodyTalk Protocol Chart to determine what the priorities are to address in a session while identifying body parts and systems in need of reprograming. The BodyMind Complex healing process is then initiated by gently tapping on the client’s head, heart and gut. The practitioner will continue to “talk” to the BodyMind Complex until the client’s innate healing system signals the end of the session. What happens during a BodyTalk Distance session? What does the tapping on the head, heart and gut do? Tapping on the body has been used by indigenous holistic systems, like yoga, for centuries. In BodyTalk, tapping on the head tells the brain to “fix” damaged communication circuits. It also tells the heart to “store” the fix. And finally, tapping on the gut assists in the synthesis of all changes. This activates the brain and helps facilitate the body’s own ability to restore and maintain optimum health, producing lasting results. How long is a BodyTalk session? Each session is unique to the individual client. However, on average, a session will take between 30 to 45 minutes. The length of the session doesn’t indicate the quality of the treatment or the results that can occur. Even the simplest sessions can be profound and transformational. If I’m going for BodyTalk sessions can I continue to see my regular doctor/specialist? Absolutely! BodyTalk works together with all medical or psychological treatment. It’s recommended for anyone with such conditions to continue seeing their medical doctors and a holistic practitioner. 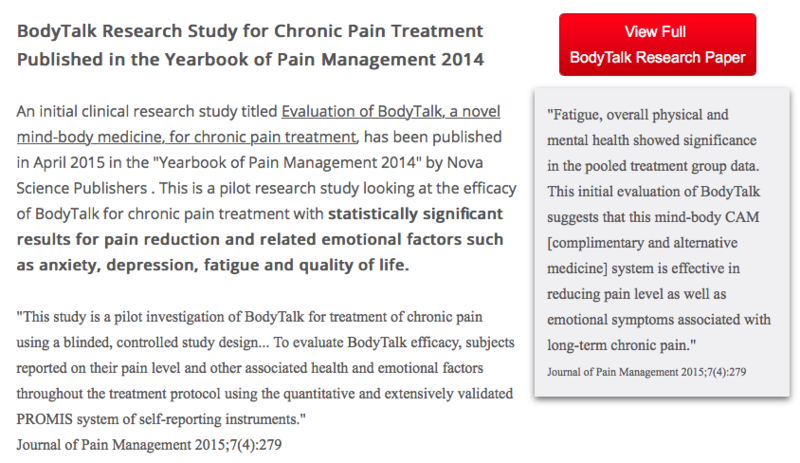 BodyTalk can help reduce side effects from medications, chemotherapy, and radiation. It also can speed up healing after surgery or injury. BodyTalk works in harmony with all medications, surgery, physiotherapy, and all methods of alternative care. A BodyTalk practitioner can even design a session specifically to help the client get through a stressful procedure, like an MRI or surgery. What does a healing process look like in a BodyTalk context? If we are bringing about change in various body parts through BodyTalk, there is going to be a healing process. While this is quite different from a healing crisis, we must still understand what a healing process looks like. For example, if someone has an arthritic hip and we do a BodyTalk treatment that increases circulation and nerve supply to the muscles and articular capsule, there is going to be better functioning of the joint. At this point, it is likely that the joint will become sore because it is working more, moving more and there is repair going on. Not only is this unavoidable, but it is part of the natural healing process. If you start being able to use a joint that has not functioned properly in years, there is going to be some pain as it gets moving again. A healing process can occur in any part of the body where you are bringing about a change. Such changes can cause things to feel stirred up. The difference is that this discomfort is associated with a straightforward path of repair versus a healing crisis which can be severe, sudden, and so stressful that it reduces the effectiveness of a treatment. In BodyTalk, another common example of a healing process is when treating a chronic virus. When the treatment starts, the client will often report a high temperature with some aches and pains. This is the most straightforward and natural way for the body to get rid of the virus. By actively assaulting it, the virus gets stirred up leading to some aches and pains, and the increase in body temperature is the immune system’s standard method for killing off viruses. In these situations, we want to warn the client that they may notice a fever and some aches as part of their healing process. ​So, once again, a healing process is quite natural as opposed to a healing crisis which is triggered by therapies that force repair or follow a sequence that is less than ideal. What does a client feel during a BodyTalk session? Sensations felt during a session vary from person to person. Some people experience physical feelings of warmth or coolness, while others feel tired and have the urge to sleep. Many clients will also hear their stomach start to gurgle. All these things can occur when energy starts to shift and change within the body. Some people might not notice any physical sensations, but almost all clients feel a sense of calm and relaxation during a treatment. Is BodyTalk safe for pregnant women, children, and babies?